A very rare and exceptionally beautiful Russian Pendant. Hallmarked for the period 1898-1907. Set with one stunning Natural oval cut Ruby of 1.50 ct, two major diamonds of 1.60 ct and 1.30 ct, antique cushion cuts, and numerous smaller diamonds equal to 2.00 cttw. There is a makers mark but who that person is remains a mystery. 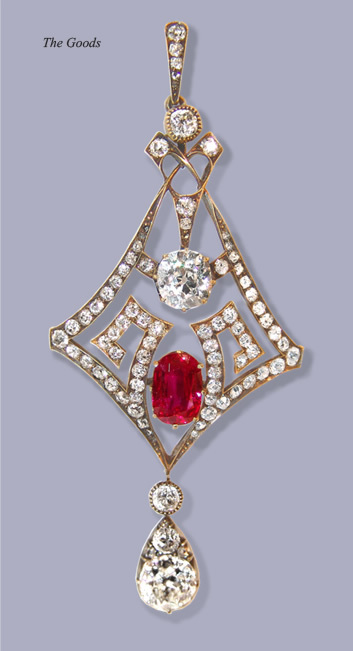 This wonderfully beautiful pendant is in excellent condition and represents the finest quality investment piece.